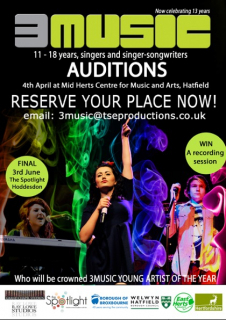 Are you a young singer or singer-songwriter from Welwyn Hatfield? 3music needs you! 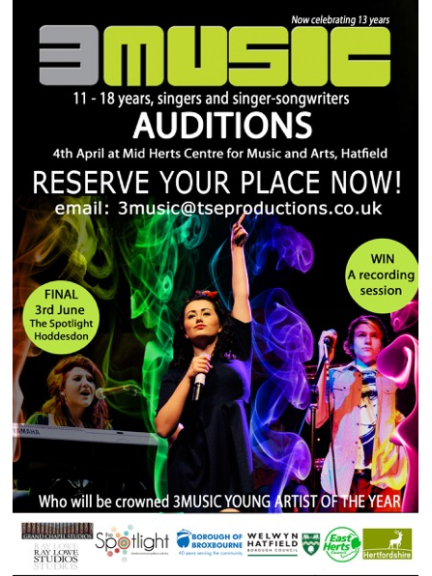 3music, the annual competition which is funded by Welwyn Hatfield Borough Council, provides young people the opportunity to learn, develop and showcase their talents in a supportive and creative environment along with the support of industry specialists. There are a selection of prizes up for grabs with the overall winner receiving a recording session. Posters and promotional flyers will soon be available so please use the contact details below if you would like any delivered to you to put up on notice boards etc. In the meantime, please pass this information on to any relevant contacts and encourage young people who you feel may benefit from this opportunity to register for an audition.